The Silver Star Full Platform Exterior Lift from Pride lets you take your scooter or power chair on the road safely and reliably. An all-steel frame and protective coating mean Silver Star Lifts are built to be durable, while quality construction means you can count on your lift to be dependable. 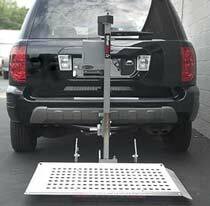 From loading to lifting, Silver Star lifts are designed with ease of use in mind. Silver Star Lifts from Pride Mobility are now "New & Improved." New great features include shock absorbing technology that reduces vibrations to your power wheelchair, product re-design that reduces metal-to-metal contact for enhanced performance and longer product life and a helpful self-leveling feature that makes loading and unloading your wheelchair on unlevel terrain a whole lot easier. Great choice for scooters or power wheelchairs. Maximum Scooter/Wheelchair Width - 27"